Sitting in that convention center meeting room for last week’s NASCAR Hall of Fame voting was an experience which will never be forgotten. A lot of things went through the mind as I sat down, opened my notebook, picked up my free pen and looked around at the faces of my fellow voters. One of the things which went through the mind as I looked at the panel – which included nominees Junior Johnson, Ned Jarrett and Bud Moore – and then down at the list of names which would be on the ballot for the inaugural class, was that there was not a Michael Jordan to be found. And that is terrific news which says a lot about NASCAR and its heros. The bet here is that for the foreseeable future, nobody elected to NASCAR’s Hall will show up at induction ceremonies and start spewing the type of poison which Jordan did when he was honored by the NBA last month. Jordan is not only the greatest to have played the game, he has become viewed as a symbol of the modern NBA. Detractors of the sports in these times would say he did nothing to diminish his standing as a symbol after grabbing the microphone in Springfield, Mass. in September. They will say that Jordan only added to the image of professional stick-and-ball players as being selfish, boorish, vindictive and petty. In case you missed it, Jordan, in accepting enshrinement, issued a screed against former colleagues, former teammates, coaches and even his high school coach. He used the ceremony to settle old scores and vent what could only be construed as pent-up vindictiveness. Thankfully spared was Charlie Sheen of the underwear commercials. The guess here is that David Pearson will not grab the microphone and blurt out the opinion that he, and not Bill France Jr. or Dale Earnhardt, should be among the inaugural classmates. The guess here is that neither Brian France nor Lesa France nor Jim France nor whomever accepts the honor of being inducted for their relatives will lean into the podium and smugly say, “Take that Hulman George family”. The guess here is that the only thing petty about next May’s induction ceremony will be a guy named Richard. Memo to self: Do not answer phone if caller ID reads, DStern. I have waffled on the size of the first class. It should have been 10 members. I was cool with the idea of five as I walked into the room where the vote was held. A stickler on the philosophy that enshrinement in any hall of fame should be tough, I figured five to be a good number. The change of heart came as I stared and stared at the ballot on voting day. By anybody’s standards, there were a minimum of 10 worthy candidates. It all really hit home as I left the room after the vote and standing there, 10 feet in front of me, was David Pearson. I opted for Junior Johnson over Pearson and was already wondering about that as I handed by ballot to the woman from the accounting firm. I could not look Pearson in the face. Memo to self: I’m glad Cale Yarborough, Bobby Allison and DW were not standing outside that meeting room. Following the Nationwide Series race at Auto Club Speedway a couple weeks ago, word rippled through the media, the blogosphere and the Twitterosphere that a big confrontation between Greg Biffle and the father of Joey Logano, had resulted in the stripping of Tom Logano of his annual NASCAR credential. Didn’t quite happen that way. So says an actual witness to the incident – Greg Biffle. Note to self: Hmmm, better sit on that story about Gordon going to astronaut training school. Am thinking that the decision by Kasey Kahne’s team to go with the R5 Dodge engine earlier in the Chase may be being second-guessed. 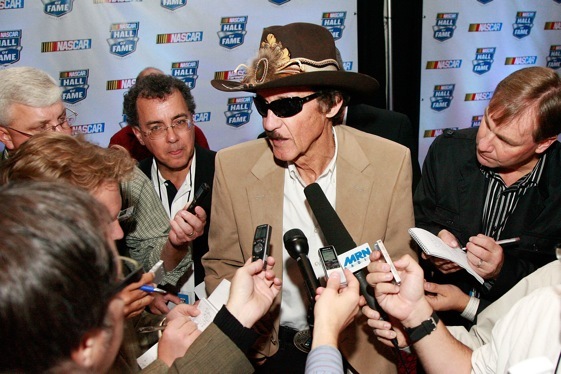 To give Richard Petty s speech would be so easy. Here’s the line “Its just one of those racing deals” ..Again do we have to go over why he is a legend he will be short and sweet and it will be time time to eat. I wondered this weekend if the only reason that RPM went back to the R6 for Kahne was because they were so far out of it. Of course, given the second place finish, they could be ruing the fact that they went back to the R5, but at the same time, I have a feeling they don’t make the switch back if they’re only 30 points off the lead.